Shielding current city attorney Patrick Muñoz from any scrutiny or accountability, on February 20th 2018 city council members Joe Muller, Richard Viczorek and John Tomlinson voted, in public, on the record, to not seek competitive bids for legal services to the city of Dana Point. Lawyer Patrick Muñoz, through his law firm, Rutan & Tucker, has held the contract with the city of Dana Point for 16 years. Since awarded, the contract has never been opened for competitive bidding. A motion was brought before the city council on Feb. 20, 2018, to invite competitive bids from any qualified law firm, including Mr. Muñoz’s firm. The end result is that Mr. Muñoz continues to receive our tax dollars at whatever rates he can get away with and regardless of any measures of performance. The most charitable interpretation is that we’re seeing contemptible cronyism at work among the three council members who voted against allowing open bidding. It also looks a lot like city hall corruption. Where did the suggestion come from to open that contract to competitive bidding? 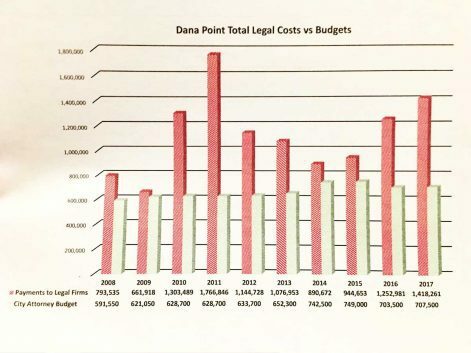 From a sub-committee of Dana Point citizen-volunteers called the Financial Review Committee which was formed as a financial watchdog body. Literally moments after voting to protect Mr. Muñoz from competition and accountability, those same three council members then voted to silence and dissolve the Financial Review Committee. The time has come to vote these three members, Joe Muller, Richard Viczorek and John Tomlinson, out of office and clean up our city hall.